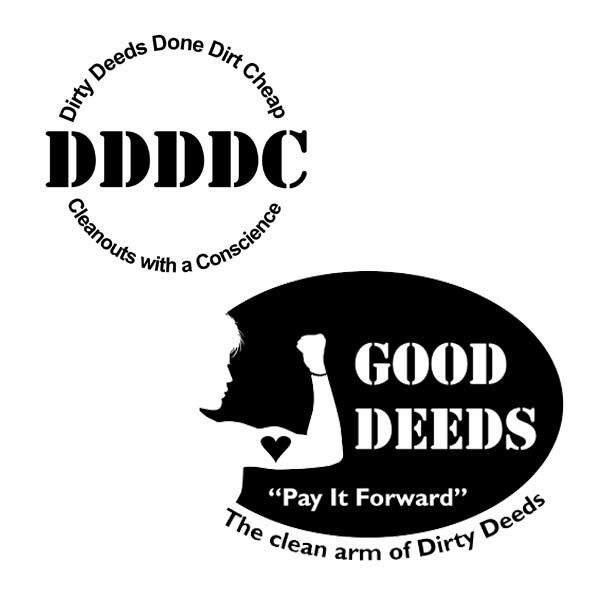 A couple of years ago, our wonderful friend Janet LaBerge asked us to create a logo for her business, Dirty Deeds Done Dirt Cheap = "cleanouts with a conscience." Now, she just opened another division of the company, "Good Deeds." It's a store where she collects all of the stuff she's gathered from cleanouts, and puts them up for sale for great prices. Then, every month, she donates the profits to a different local charity. 1. Her original old logo for Dirty Deeds had a "Rosie the Riveter" clip-art of a woman making a muscle, wanted to bring that back somehow. 2. It's a woman-owned company, so let's show a woman. 3. Should use the same font as Dirty Deeds for continuity. 4. Dirty Deeds was black on white, so let's do white on black for contrast. 5. Dirty Deeds is a circular logo, so wanted to use some sort of circle or ellipse. 6. Janet is all about community and caring, so let's put a heart in there. She also has a tattoo, so wanted her to have a tattoo! 7. Her mantra is "Pay It Forward" so wanted to get that in there. 8. She jokingly said that this company was "the clean arm of Dirty Deeds," so of course had to fit that in. Plus, it IS an arm! 9. Janet's famous for wearing her "Mel's bracelet" to support cancer survivors, so sneaked that in.